SOUTH LOOP — The much ballyhooed but delayed DePaul University basketball arena and Marriott hotel to be built near McCormick Place are inching closer to reality. Construction on the massive South Loop development is slated to begin in July, Prairie District Neighborhood Alliance President Tina Feldstein told residents Monday at Second Presbyterian Church, 1936 S. Michigan Ave. The arena and hotel would open in summer 2017. The projects, along with a new Green Line station on Cermak Road, anchor City Hall's plan to transform the area surrounding McCormick Place into an entertainment district, but have been fraught with delays. The Metropolitan Pier and Exposition Authority, the quasi-public agency that would own and operate the 10,000-seat arena and event center, said in November it would push groundbreaking of the so-called McCormick Place Event Center to the spring as the arena's cost ballooned to $164 million. 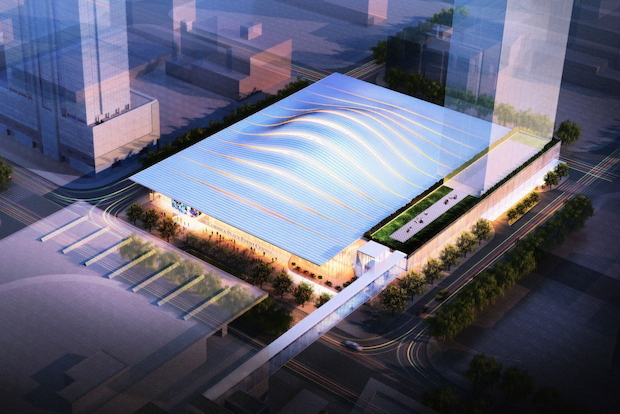 The authority, also known as McPier, is splitting arena construction costs with DePaul. In addition to hosting DePaul's basketball teams, the venue would also host conventions, Chicago Public Schools graduations and other events. The development at Cermak Road and Prairie Avenue also calls for construction of a 1,200-room Marriott Marquis hotel abutting the arena. The Chicago City Council last year voted to earmark $55 million in tax increment financing funds toward the high-rise hotel, but not the arena. Last year, McPier moved the landmarked Harriet F. Rees House to make way for the development. A DePaul University spokeswoman did not immediately return a message late Monday. Offices of McPier and Bethesda, Md.-based Clark Construction Group, which is leading the venture that is building the arena, were closed Monday night.